One hundred thousand (100,000) is the natural number following 99999 and preceding 100001. In scientific notation, it is written as 10^5. Since October 2012, we have created hugely popular sharable content, together with our agency Propaganda introducing clever crowd-sourcing initiatives, celebrating 100s of Kryolan store openings, events, shows, trendlooks & tutorials, and engaging fans with inspirational content – all based around the amazing world of professional make-up artistry. Kryolan is famous for its heritage, world-class products and its unique scientific approach to creating make-up. Kryolan’s founder, Arnold Langer, is a chemist, and the brand is now run by three generations of the Langer family. With a sustained creative social media strategy we managed to see the numbers of dedicated Facebook fans rise from 25,000 to 100,000. What’s more, the levels of engagement & sentiment for the brand are second-to-none. Nadine Langer, Kryolan’s marketing manager, says: “As an international brand experiencing an intense rate of growth, social media is crucial to us. Make-up artists are the life blood of our business, and social media not only lets us share our news on a real-time basis, but allows us to have a dialogue with the people who are SO important to us – and celebrate and share their work too. Our social media fans & followers are all fantastic." 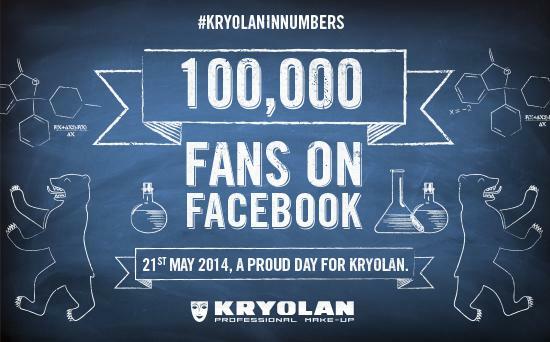 To mark the milestone, Propaganda has created a visual countdown of key Kryolan milestones to share on Facebook - #KryolanInNumbers – to highlight the elements of its business that Kryolan holds dear; its scientific heritage, the family, product innovation, its ongoing growth & commitment to global audiences and, of course, its expanding audience of professional make-up artists. Check out the #KryolanInNumbers, and ‘like’ Kryolan on Facebook: facebook.com/kryolanprofessionalmakeup. You can also keep up with @KryolanOfficial on Twitter, Instagram & Pinterest.